Ripple’s CEO has said that there are too many people using blockchain as ‘a buzzword,’ who aren’t developing real world use cases. According to Garlinghouse, the uses being implemented through the distributed ledger could be better applied via a database. He didn’t give names as to these use cases. Ripple’s digital asset, XRP, functions similarly to bitcoin on the blockchain. At the time of publishing, on the 4th October, Ripple is the third most valuable digital currency in the market. One token is currently worth $0.211993, which is a 5.43 percent rise in 24 hours. Over seven days its value has increased by 4.32 percent. 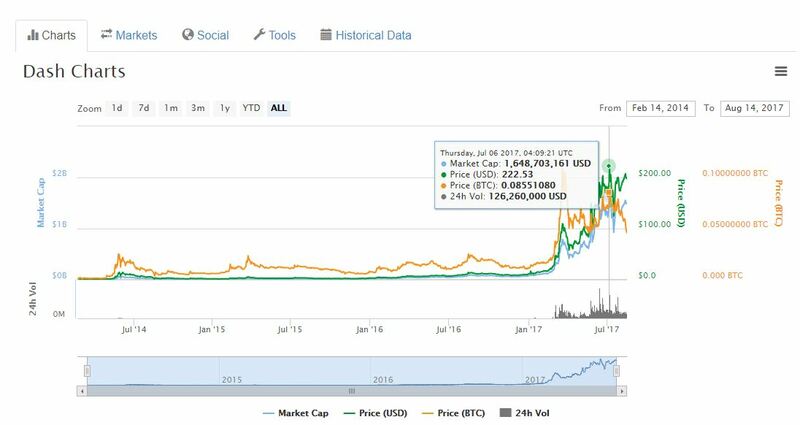 Its market value is currently worth $8.1 billion, pushing it ahead of bitcoin cash. One of the main and first uses of the blockchain technology was within finance. Since its early days, however, the technology is being employed in a variety of sectors. These include healthcare, education, supply chain management, energy and humanitarian to name a few. According to Garlinghouse, Ripple has the potential to change the finance sector. It’s clear the market has the potential to change the financial industry. This is being realised through use cases every day. This can be seen through IBM’s endeavor with the technology. In June, it was reported that the global technology company was creating a blockchain that will be used by seven of Europe’s largest banks, called the Digital Trade Chain. The consortium will include Deutsche Bank, HSBC, KBC, Natixis, Rabobank, Societe Generale and Unicredit. This is to aid international aid for small- and medium-sized businesses. As a result, it will mark one of the first real world use cases involving the technology. Even though the banking sector has been researching into the blockchain for years, it’s only now that applications are beginning to emerge. Draijer stated that many tests with banks and fintechs are underway experimenting with the blockchain. However, this venture with IBM demonstrates how far the financial world has come with its experiments. Of course, while Garlinghouse claims too many people are using the blockchain as a buzzword, there are plenty of real use cases for it. For instance, in tracking food to improve consumer confidence. China is one country that is using the DLT to track China’s pork and chicken. Last year, Walmart teamed up with IBM and the Tsinghua University in Beijing. By putting Chinese pork on the blockchain it’s hoped it will prevent food disasters occurring. The success of this venture has meant that Chinese web insurer ZhongAn Technology is using a blockchain-based platform to track the entire chicken farming process. It’s hoped this will improve China’s food safety concerns. More recently, Japan’s government has revealed that it too is using the technology for its wild game meat. By using a NEM-based blockchain it will build and store its transaction records. Through the Mijin blockchain consumers will be able to trace the meat from the hunting grounds to the restaurant. It’s also hoped that it will help with the country’s overpopulation of wild game meat. This is through the dwindling numbers of licensed hunters in the country. Another real world use of the technology can be seen through tracking aid. In 2012, Ban Ki-Moon, the 80th secretary-general of the UN, said that corruption in 2011 had meant that 30 percent of all development assistance had been prevented from reaching those who needed it. For many a solution was required, but finding it wasn’t easy. That was until the blockchain entered the scene. As a result, it’s now being used in many humanitarian situations ensuring aid gets to those who need it. The UN is one agency that is embracing the technology. So much so, that it’s reported that there are seven UN organisations experimenting with the technology. The UN Office for Project Services (UNOPS) has organised a working group of agencies looking into it. These include the WFP, the UN Development Programme (UNDP), the UN Children’s Fund (UNICEF), UN Women, the UN High Commissioner for Refugees (UNHCR) and the UN Development Group (UNDG). The Indian state of Andhra Pradesh has announced it is working with cybersecurity firm WISeKey to store citizens data on a blockchain securely. Andhra Pradesh, bordering India’s southeastern coast, is the seventh largest state in the country. In an announcement, Swiss-based WISeKey and Andhra Pradesh will explore blockchain technology proof-of-concepts as pilot projects across a variety of departments. The aim is to simplify processes and to enhance security in light of cybersecurity attacks worldwide. Earlier this year, malicious malware known as WannaCry crippled over 75,000 computers in 150 countries. It was the most audacious cyberattack to take place. According to Microsoft, it was a ‘wake-up call’ for governments to take action to prevent these attacks from happening. Shortly, thereafter, the NotPetya cyberattack targeted vulnerable computers around the world. Many victims were ordered to pay bitcoin ransom demands to receive access to their files. In an attempt to take decisive steps, the government in Andhra Pradesh is taking measures to better protect citizen data. With a population of 88 million people there is a wealth of information that needs to be stored securely. To ensure this, it is teaming up with WISeKey to keep its various databases secure. In August, it was reported that the state of Andhra Pradesh was exploring the distributed ledger to record land deals. A second Indian state, Telangana, is also considering it too. The aim is to provide transparency to a corrupt system that leaves the poor at risk. Most land ownership in India dates back to the colonial era. As such, knowing who owns what is fraught with difficulties. As a result, many people, particularly the poor, are left vulnerable with disputes ending up in court. However, the use of the blockchain could provide better transparency for all concerned. Once a sale has been recorded on the blockchain, land owners, banks, sellers and brokers can track the record. This, in turn, gives everyone peace of mind that everything is above board. McKinsey Global Institute, the research arm of the global consulting firm, states that India’s land markets are hindering the country from producing more growth. Consequently, lost gross domestic product growth each year accounts for 1.3 percent. These latest steps by Andhra Pradesh are not its first venture into the blockchain. In fact, its first steps can be traced back to 2016. As early as then it was looking into the technology to fight cybercrime. As a result, it became the first state in Asia to implement the blockchain to provide cybersecurity and curb hacking. Fintech payments firm Ripple has opened a new office in India’s business capital, Mumbai. It’s hoped that the company will be capable of providing more customers with a faster settlement of international payments. India has a population of 1.3 billion people. This expansion into India provides Ripple with a wealth of opportunities. Namely, because the country is the largest remittance receiver in the world. Ripple’s main objective is to get banks more attuned to the blockchain as a way of delivering faster payments. For those sending money to India they may soon find themselves turning to Ripple’s services. It remains to be seen what success this will bring to Ripple. Yet, considering India receives the most remittance payments in the world, the firm may see an uptick is users. Over the last few years, India has been taking significant steps to embrace a digital agenda. What has helped to push the country forward was the removal of its two biggest banknotes: the Rs 500 and Rs 1,000. Last November, Narendra Modi, India’s prime minister, ordered their removal. As such around 90 percent of the nation’s currency was wiped out overnight. The aim was to prevent terrorism, corruption and black market money. While it was no doubt a drastic move for the country, it has aided its journey toward a digital society. The number of digital currencies that have exceeded a market value of $1 billion is 10 with values ranging from $1.3 billion to $70 billion. The top 10 cryptocurrencies with market values exceeding $1 billion include bitcoin, ethereum, ripple, bitcoin cash, IOTA, litecoin, NEO, NEM, dash and ethereum classic. In first place is bitcoin with a market value amounting to $70 billion. At press time, it is trading at $4,245, which has seen a 5.42 percent rise over the past 24 hours and a 27.03 percent increase in the last seven days. After recently scaling the $4,000 mark, there is still huge demand for the digital currency. 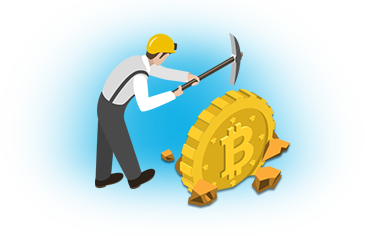 This is despite the 1st August user activated hard fork, which saw the creation of bitcoin cash. It remains to be seen how far bitcoin can go, but many are predicting it can easily reach $5,000 and even higher. Second place ethereum had attained the $300 mark again after flirting with the price for some time last week. Now, it’s trading at $297 with a 0.68 percent rise in 24 hours and 11.23 percent increase in seven days. Its market cap is worth $28 billion. At one point, it looked as though ethereum may push bitcoin off the top spot as it steadily gained on the digital currency. Now, though, that doesn’t look likely. 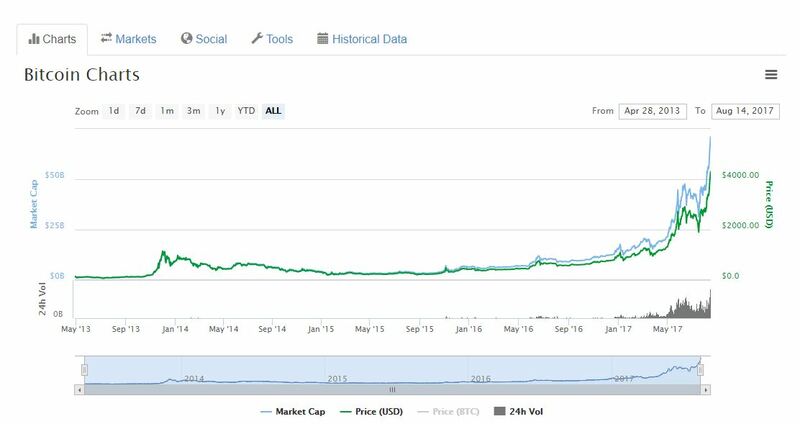 The currency has come a significant way since the beginning of the year when it was trading at $8.24, according to CoinMarketCap. Ronnie Moas, Standpoint Research founder, believes it can go much further. He’s predicting that by 2018, ethereum’s price will be listed at $400. At the beginning of August, Ripple has lost its third place position to newcomer bitcoin cash; however, it has since reclaimed the third ranking spot. Currently trading at $0.169272, it has a market value amounting to $6.7 billion. Over 24 hours its value has increased by 0.47 percent, but within seven days it has dropped in price by -5.95 percent. The digital currency is doing well to maintain hold of third place, but for how long? Bitcoin cash is the newest digital currency to enter the market. It’s also one that has entered the top 10 field so soon after its launch. Created by supporters who wanted a solution to bitcoin’s scaling issues, bitcoin cash has garnered support since it entered the scene on the 1st August. At the time of publishing, it is trading at $299, which has seen a slight drop in value over 24 hours of -2.96 percent. Yet, it has increased by 4.02 percent in the past seven days. Ranking third when it first came on the scene, it had a market value of nearly $12 billion. Now, though, it’s currently sitting at $4.9 billion. At its peak, bitcoin cash was trading at $727 on the 2nd August. However, the chart below indicates a steady decline in price. At its lowest, bitcoin cash was trading at $201 on the 5th August. 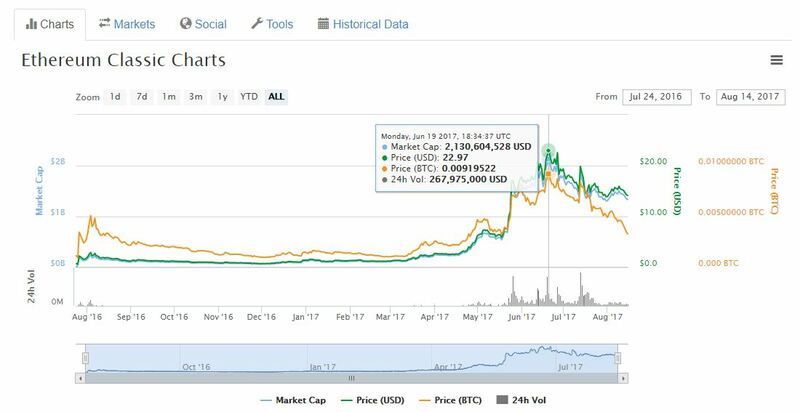 After making it easier to find blocks for the digital currency its price peaked up slightly, but it has yet to see $700 figures again. 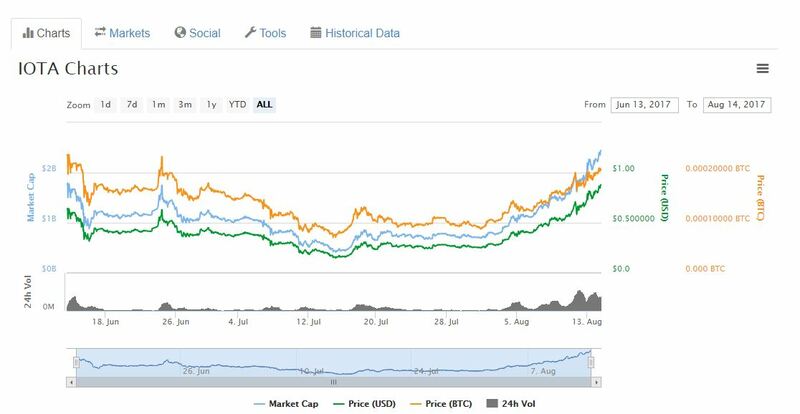 IOTA has shown some positive returns on its price in August. As such its price has steadily increased over the month. At the time of publishing, the digital currency is trading at $0.885418 and has seen an 18.37 percent in the past 24 hours. Over seven days, its value has increased by 87.29 percent. This surge in value is believed to be down to the fact that it has announced collaborations with several groups such as a non-profit organisation helping refugees. 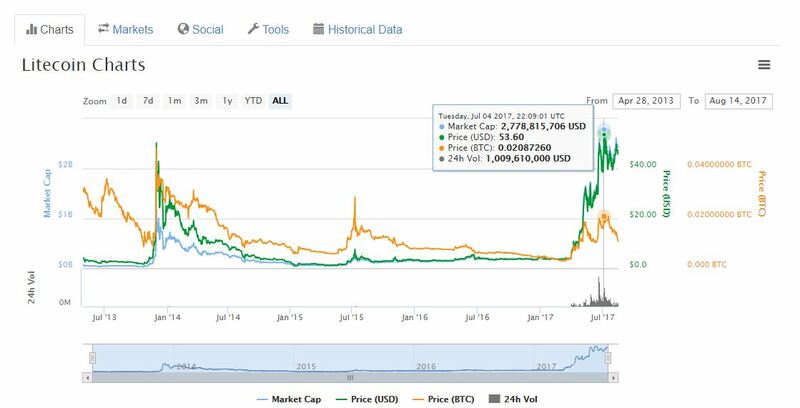 Joining the $1 billion club on the 4th August, IOTA currently has a market value of $2.461 billion. Sixth place litecoin is close on the tails of IOTA with a current market value of $2.401 billion. It’s currently trading at $45.66 and has seen a -0.70 percent in 24 hours and -0.33 percent in the past seven days. Over the past couple of years the price of litecoin has remained within the $3-5 range. However, it wasn’t until April 2017 that its price increased. This was helped along by the activation of SegWit on its network. The support of litecoin on Coinbase also played a role. At its highest litecoin has achieved over $50. Moas is of the opinion that by 2018, litecoin could easily see it trading at $80. 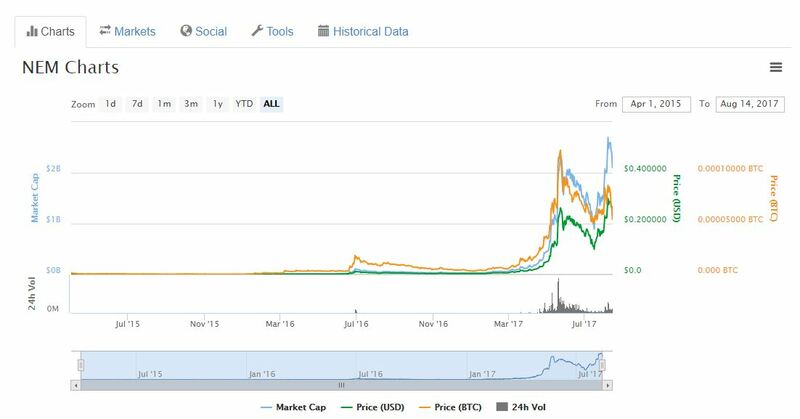 It remains to be seen whether or not the digital currency achieves this price, but it is steadily rising in price, which is giving confidence to many of its traders. Formerly known as AntShares, NEO – known as the Chinese Ethereum – has a market value worth $2.3 billion. Since undergoing a rebrand the digital currency has soared in value. In the past 24 hours, it has seen a 1.17 percent increase, but over the past seven days its value has jumped by 154.80 percent. It’s trading at $46.63. This chart, alone, indicates how far NEO has come in 2017. Grabbing hold of a $2.094 billion market cap value is NEM. It’s currently trading at $0.232741, but has seen a -12.14 percent decrease over the past 24 hours and a -13.89 drop in seven days. 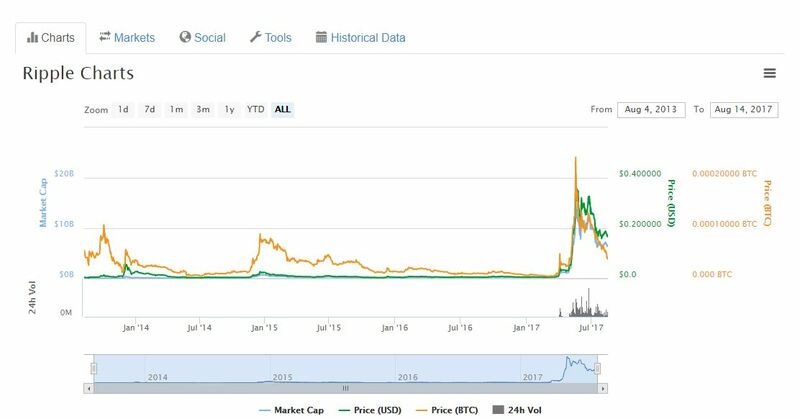 As can be seen NEM has experienced a surge in price over the first half of 2017. As we continue into the second half it remains to be seen if the digital currency can produce a higher price. With a market cap of $1.471 billion, Dash is currently sitting in ninth position. At the time of publishing it’s trading at $196, but has seen a -3.43 percent drop in 24 hours. Over seven days, however, its value has risen by 1.29 percent. On the 6th July, its value was trading at $222 when its market value was listed at $1.648 billion. In tenth place is ethereum classic with a market cap value of $1.3 billion. Even though this is the original ethereum before a hard fork took place, which saw two ethereum coins, the community hasn’t shown too much support for the original version. 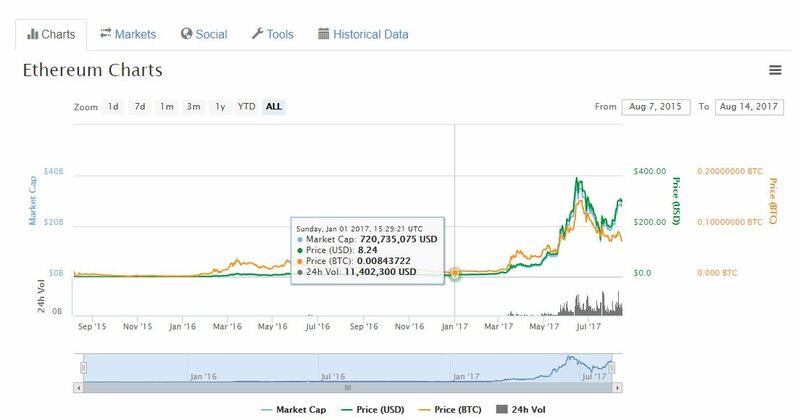 At the time of publishing this altcoin is trading at $14.14, which has seen a -1.81 percent decrease in 24 hours and a -7.81 percent drop in seven days. 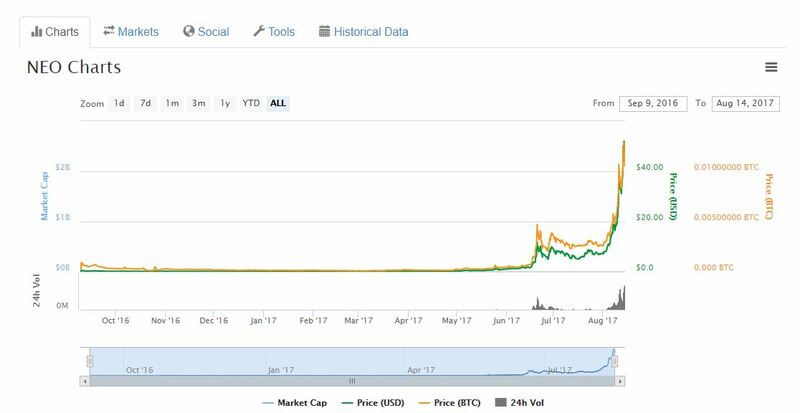 As shown from the chart above, it was back in June when ethereum classic recorded a high of nearly $23, helping to push its market value to $2.1 billion. Of course with the market producing such changeable values the top 10 could easily change, pushing some down and others not mentioned up. Who knows who will be next to join the $1 billion club.